We chose to give a home to a cat again although we had vowed, after our others passed, to have no more. 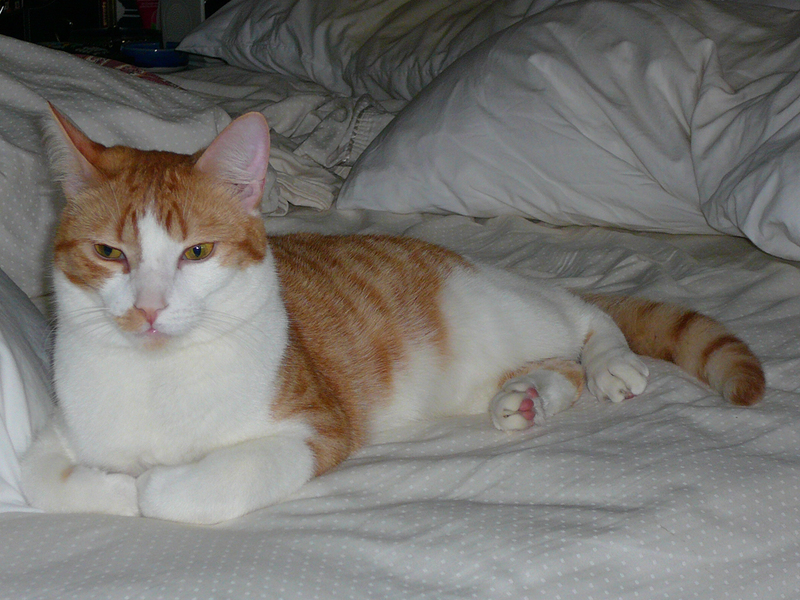 Now known as Maurice, he was abandoned and sleeping out in all weather in the back of our neighbour’s home. This cat first caught our attention with the glitter of his golden fur sparkling in the sunshine, as he hung around our neighbour in need of food. Bread and water was good enough to keep him there, but we had tuna handy and this was his first good meal in a long time. He came close to me for a second serving and I scooped him up in a satchel and went to our vet for expert care. This done, we caved in and gave him a home. Having a pet has huge benefits, especially for seniors living alone. As a cat owner and lover, I am seriously annoyed when clueless people call them “bird killers” or “mean-spirited creatures.” Not so at all! If at all possible, give homeless animals a home by adopting from a shelter. Cats do express themselves, you need only to observe. Training is best at an early age. This was a young cat that chose us. Our cat plays with his toys, loves his food and loves us. All cats love to play and need this exercise. When Maurice hears the rustle of clean sheets, he comes running to dive in! They may or may not get along with other pets in your home, depending on past experiences and temperament. But we are definitely hooked. generationsfoundation.com or call 514-933-8585 to feed a child and help a family this holiday season. 1 Comment on "Generations: Our cats and dogs are family"
All good points! Cat family members give back to us more than we give them. They are responsive, affectionate, and excellent communicators if we take the time to observe and make the effort to understand. Albert Schweitzer wrote that there are two refuges from the miseries of the world: music and cats.